Jam bands attract a big crowd. Electronica music brings in waves of excitement. Big crowds plus excitement equates to the jamtronica movement that Lotus has pushed out of the shadows and into the light. On Saturday 27th April 2019. 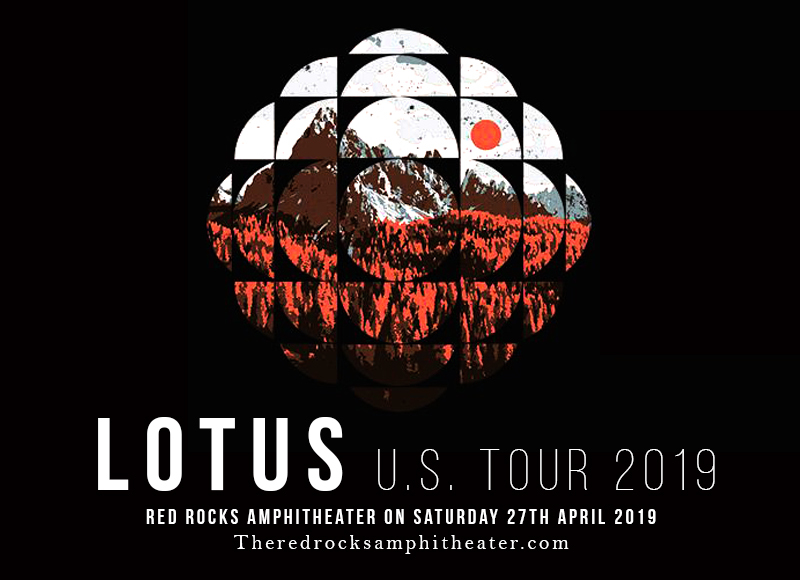 Lotus will create a lit 'livetronica' milestone at the Red Rocks Amphitheater. They have just embarked on a massive tour in support of their latest album "Frames Per Second". Fans are definitely in to capture and be part of this exciting event. With that said, tickets may just be gone with a blink of an eye. Every second counts. Get moving now; start booking your tickets a.s.a.p. ! The rise of EDM DJ superstars seems to give the impression that electronic jam bands are about to go extinct. Lotus is definitely an exception. Lotus has been holding the fort for 'jamtronica' and 'livetronica' music, keeping it as vibrant and as dynamic as ever. These guys have are definitely doing great at their jobs. They have just dropped their 14th LP, "Frames Per Second", and have embarked on another massive tour in support of it. Formed in Philadelphia, Pennsylvania in 1999, Mike Greenfield, Luke Miller, Mike Rempel, Jesse Miller, and Chuck Morris, students from Goshen College in Indiana, joined forces to play improvisational instrumental music, or what they loosely termed as 'jamtronica'. Their first album came out in 2002 entitled 'Vibes', served as a catalyst that established their reputation as a tight and exciting live act with a substantial amount of creativity and innovation that has consistently set trends and is progressively moving the electronica music movement forward. Lotus may not be your typical EDM act with lots of radio hits; but they have managed to create a buzzword amongst music aficionados in general. They received so much recognition and critical acclaim, including Jammy Award nominations (Jammy is like a Grammy Award for jam bands). Over the years, they have pulled off many sold out shows and are regular staples at numerous music festivals like Rothbury, All Good Music & Arts Festival, Summer Camp Music Festival and Wakarusa. With 14 albums spanning 16 years, Lotus is keeping the pools of jam and electronica music thriving, flowing, and flourishing. With their live shows and tours, there's an upsurge of excitement building up. What are you waiting for? Ride along and catch the wave. Book your Lotus tickets now!